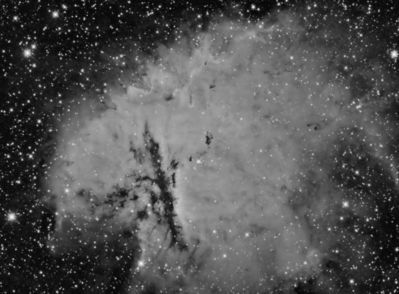 NGC 281 is a H II emission nebula in Cassiopeia containing the open cluster IC 1590, which powers the ionization of the hydrogen gas. Large dust filaments as well as Bok globules, which may be the site of future star formation, can be seen. The image is a total of 5 hrs 20 min exposure in H alpha light. Image taken with a Takahashi CCA250 astrograph and QSI683wsg camera on a Paramount ME on the nights of 13, 15 Dec, 16 Nov 2018 in Mayhill, NM (16 x 1200 sec lights @ -20 degrees C. Astrodon H alpha filter 5 nm bandwidth; 24 darks; 128 bias; 128 flats). Processed with PixInsight 1.8.5.1353 Ripley (x64).